Wrigleys bubble gum, Hubba Bubba, is being promoted in Australia with a TV ad full of suspense. We begin at the front gate. All the spikes on the fence have been covered, as have the barbs on the barbed wire. In the garden the rose thorns have been covered with tissue. In the wine cellar bottles are missing their corks. Why? What is going on? A meat hook and a pitch fork are why. 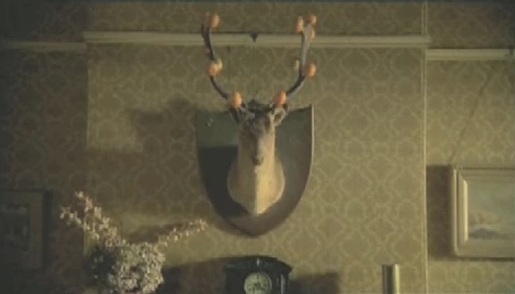 The deer antlers in the lounge have fruit. The ‘rabbits ears’ television antenna have ping pong balls. Forks on the table are turned toward the table. Soft toy stuffing has been used to protect the picture frames on the bench. An electric razor in the bathroom has been used to shave the cacti. The ginger cat is wearing red slippers made from curtain material. Why? Why? Why? It’s all to make possible the phrase, “Long Live The Bubble”. The Long Live The Bubble spot was developed at DDB Sydney by executive creative director Matt Eastwood, creative director Steve Back, art director Simon Johnson, copywriter Charlie Cook, agency producer Claire Seffrin. Filming was directed by Justin McMillan via AHT, Sydney, with producer Sam Levene and director of photography Callan Green.